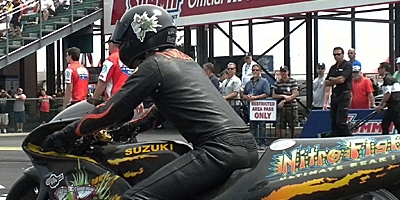 GT Tonglet didn’t come up with a round win Sunday in the Big O Tire Nationals at the Strip at Las Vegas Motor Speedway, but he was nevertheless pleased with the performance of his new Nitro Fish Suzuki. Tire smoke put an early end to the competitive race day for Clay Millican and Tony Pedregon while Pro Stock driver Jeg Coughlin Jr. was the only Nitro Fish associate-sponsored driver to advance to the quarterfinals. Tonglet knew he had a tough first-round foe in his initial race of the year – full Throttle Series points leader Eddie Krawiec – but he was nevertheless happy to be in the top 16. He was timed in 7.089 seconds at 189.82 mph to Krawiec’s 6.938 at 194.02.